9I finished off another piece that was in the batch of smelly furniture I purchased a few weeks ago. (You can read more about that here.) 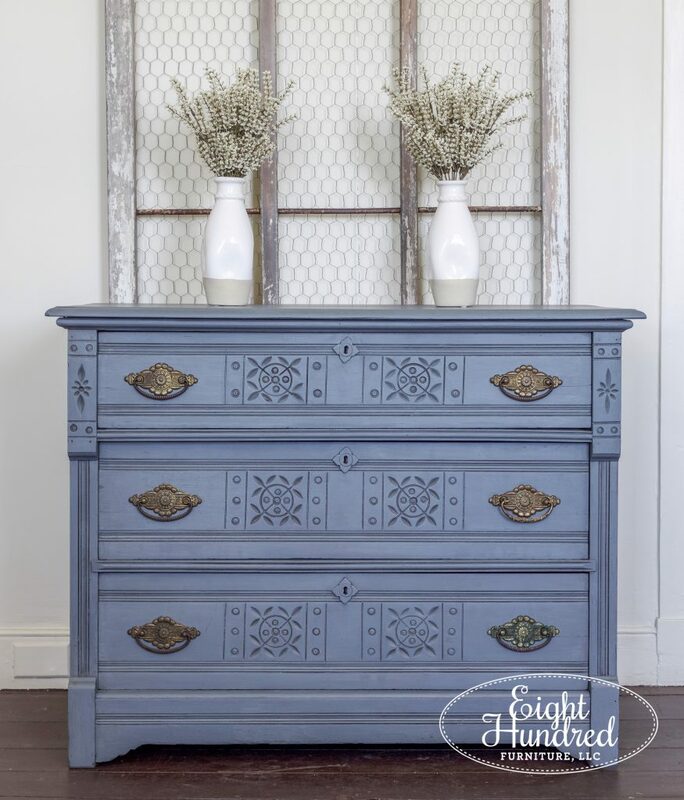 It was a gorgeous Eastlake dresser that was the least smelly of all the pieces. I gave it the same cleaning treatment as its counterparts, and it’s daisy fresh once again. 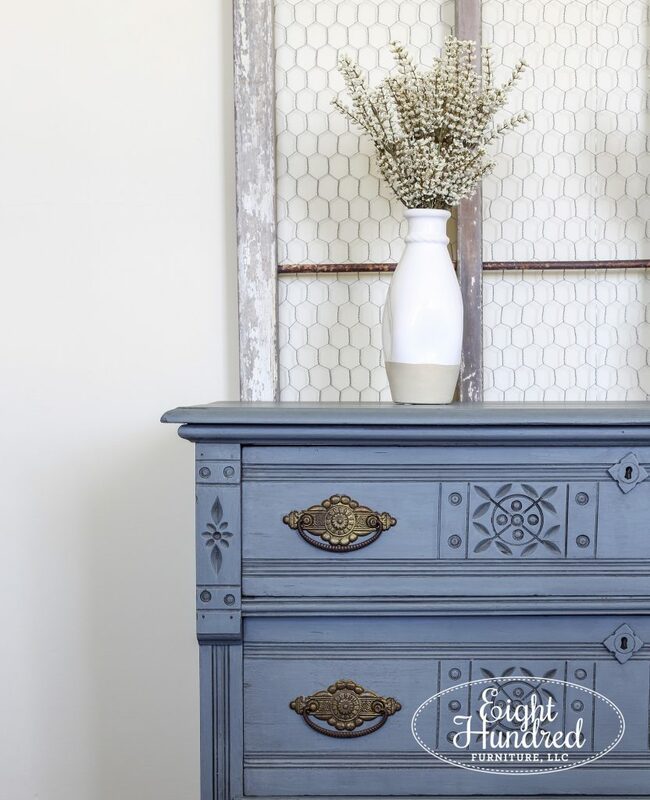 I decided to paint it using Miss Mustard Seed’s newest color in her Milk Paint collection, Aviary. 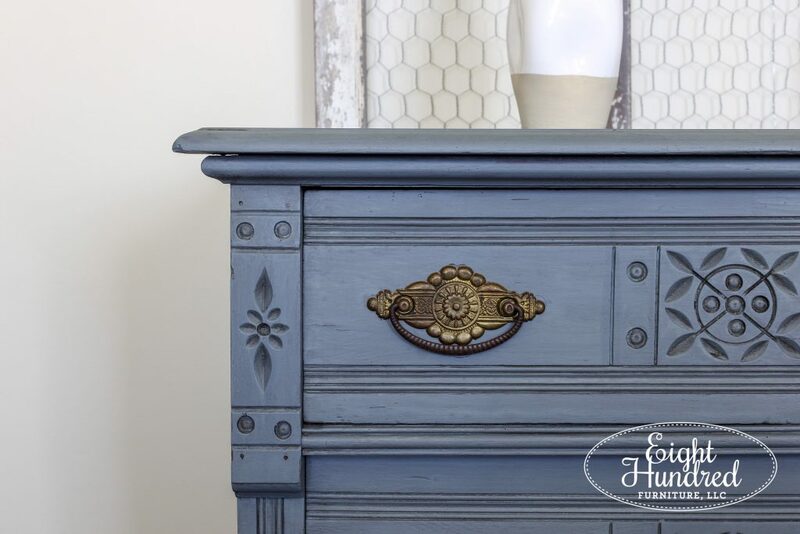 This smoky blue gray looks amazing on just about everything. 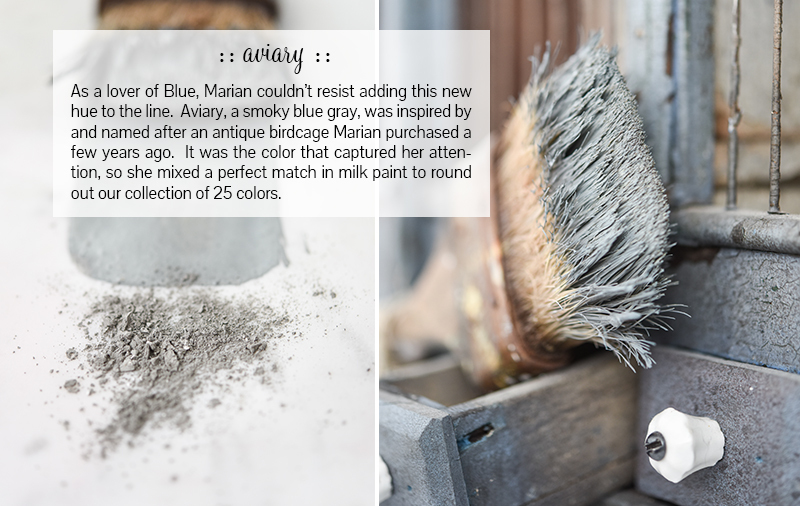 If you’re ever unsure as to what color you should paint something, use Aviary. It will most likely look amazing. Here’s the little line of paint that I was cleaning up along the tops of the drawers. 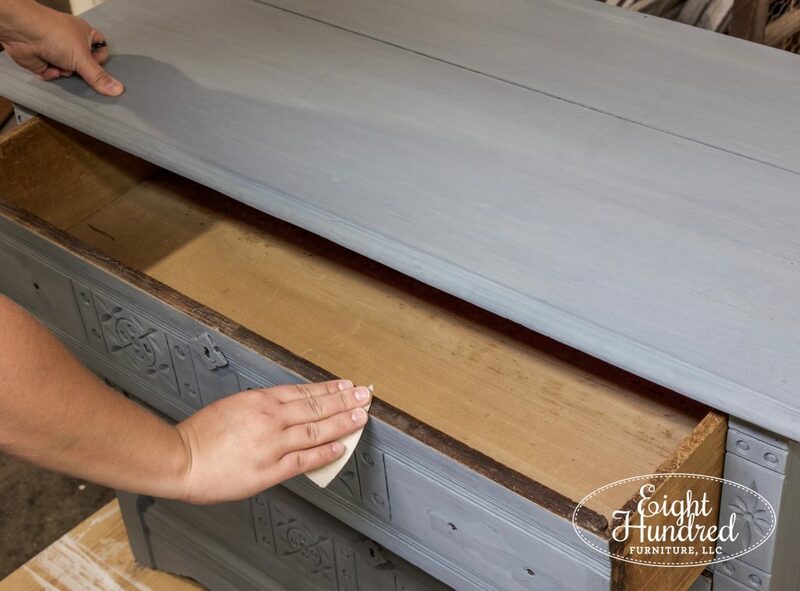 A bit of the paint seeped in there and I always like to go in with sandpaper to clean that up. Once the piece was cleaned up and vacuumed off, I sealed it with a layer of Hemp Oil. 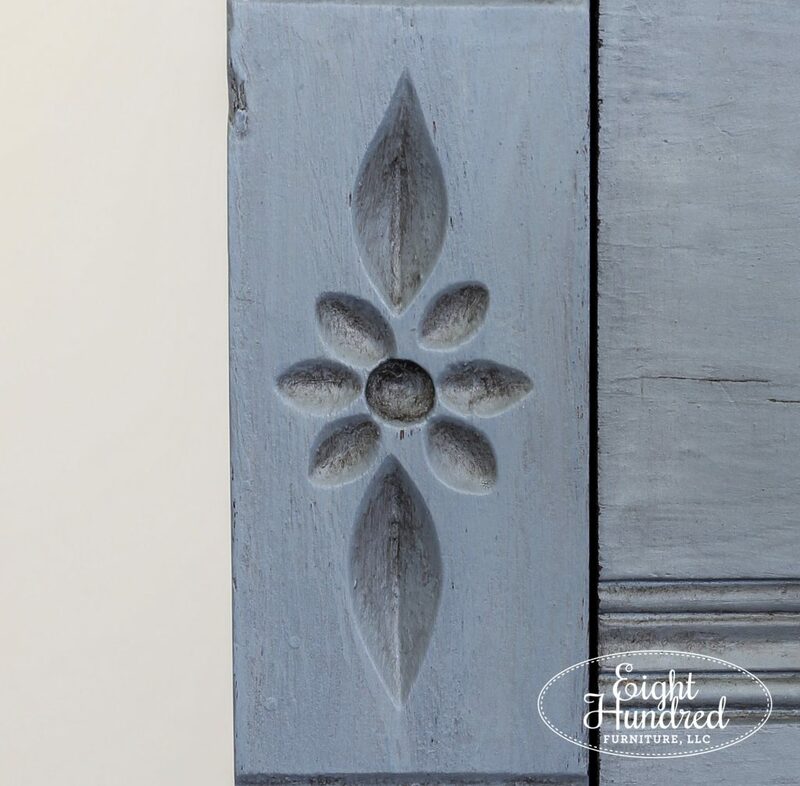 This finish is my absolute favorite to apply because MMS Milk Paint becomes rich and deep once the oil hits it. You can see what I mean on the bottom drawer below. See how the paint almost “wakes up”? Oh, it’s a lovely thing to watch! 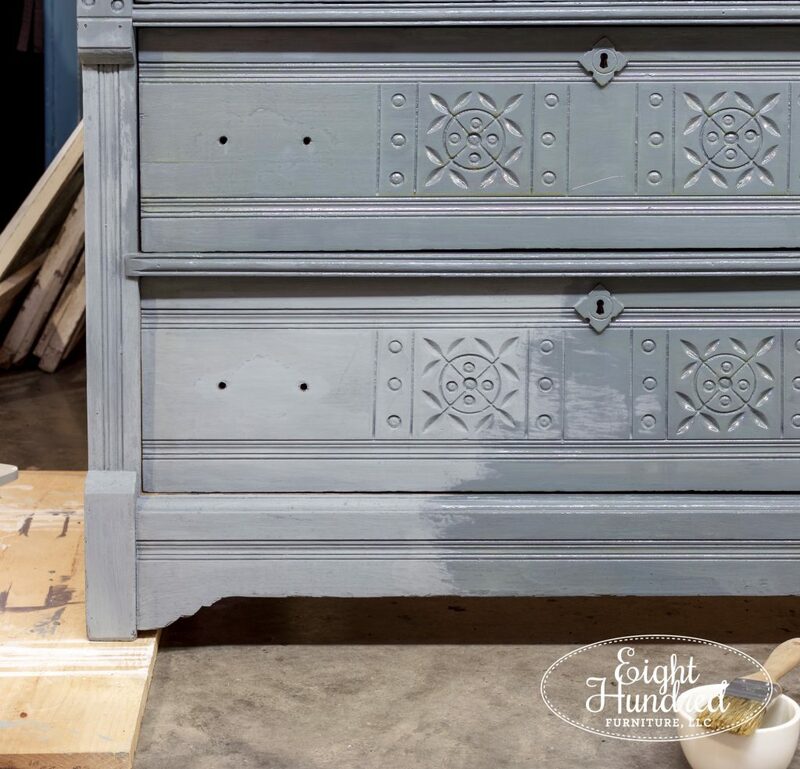 Now as pretty as Hemp Oil is over MMS Milk Paint, I wanted to add another finish over the oil to add some more depth and dimension to draw the eye in to appreciate those carved details! 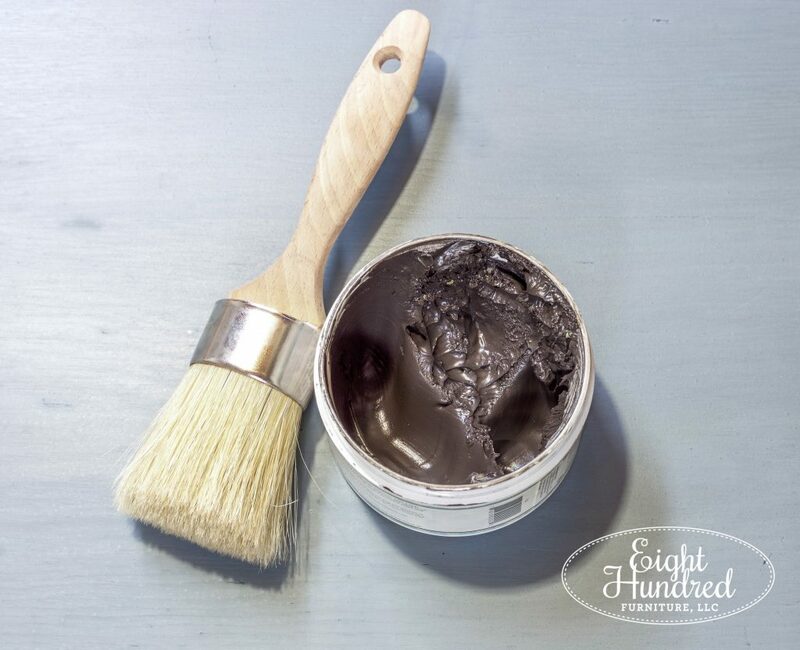 Now if you’ve never used a dark colored decorative wax before, know that it can look a little scary when you apply it. Don’t worry. Everything is okay! You don’t leave it like this. 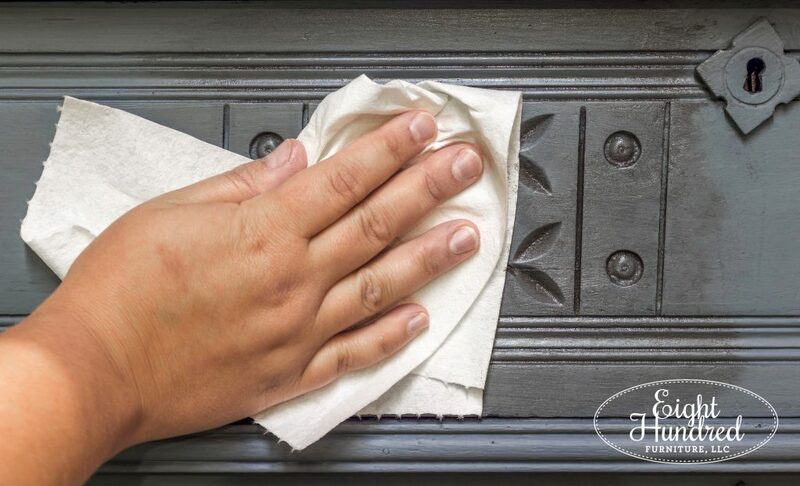 Grab yourself a lint-free cloth or rag (something like this) and wipe the excess wax off the surface. See? That’s not so scary, is it? 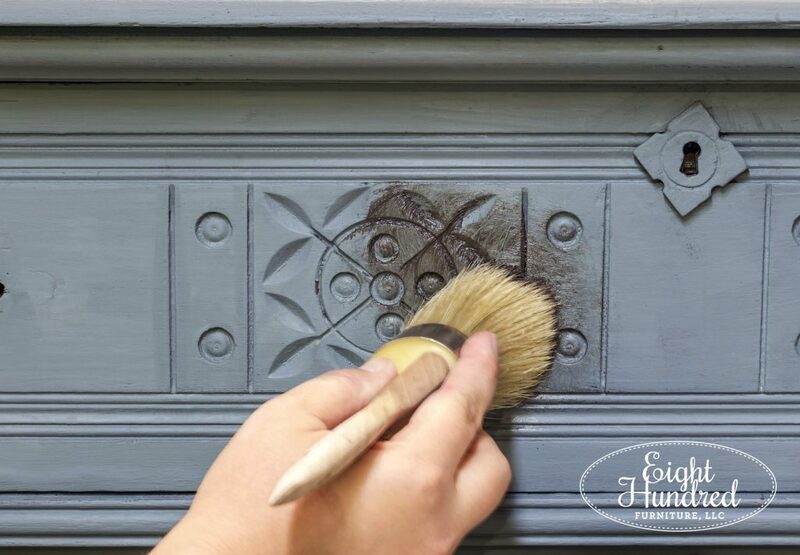 I work in small sections when I apply decorative waxes. 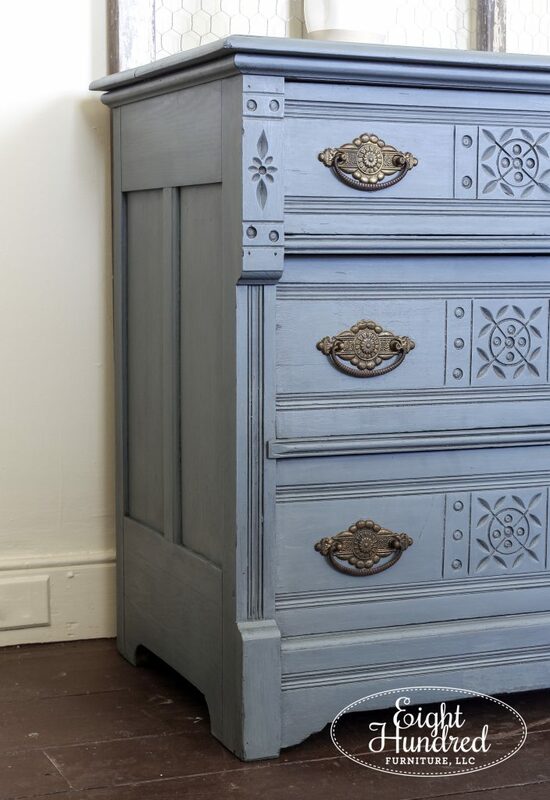 On dressers, I work on one drawer at a time and then my other sections are the top, sides, and bottom. Once the piece was all waxed and looking gorgeous, I let it sit for a few days to settle. Today was a really exciting day because Marc helped me move into my new second location at The Paxon House with Tracy McClaskey of Homestead Studios! We spent the day loading Marshmallow up with goodies and driving them over to set up my room on the second floor. (It’s the second and third windows in from the right on the top floor.) The room is coming along nicely and I’ll be adding to it all this week leading up to Homestead Studios’ soft opening this coming weekend. 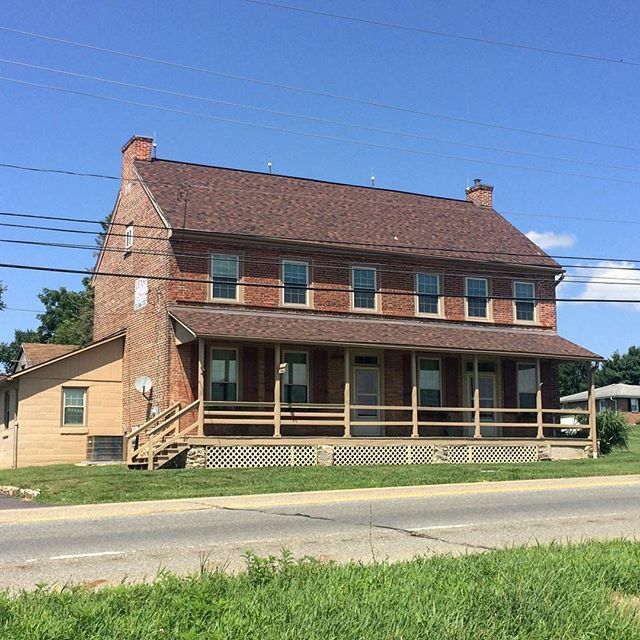 If you’d like to swing by and check everything out, the address is 4201 W. Lincoln Highway in Parkesburg, PA. The shop will be open on Saturday 8/4 from 10-5 and Sunday 8/5 from 12-5. 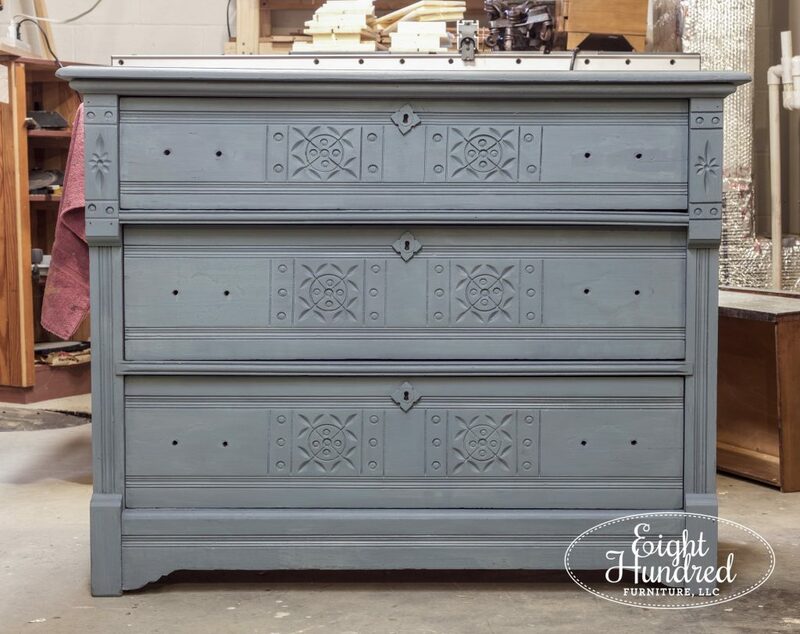 One of the pieces that we brought in today was my finished Aviary Eastlakedresser. I have two lovely windows that cast just the right amount of daylight onto the opposite wall, creating the absolute perfect place to stage for photographs. As I was lining up my shots, I kept commenting to Marc about how much I wished the light at home was like the light in my room. The walls of The Paxon House are plaster, so I brought in both of my greenhouse windows to serve as “walls” that I could hang wreaths from. I don’t think I’m going to sell these right away, because they add such a nice background behind my pieces. 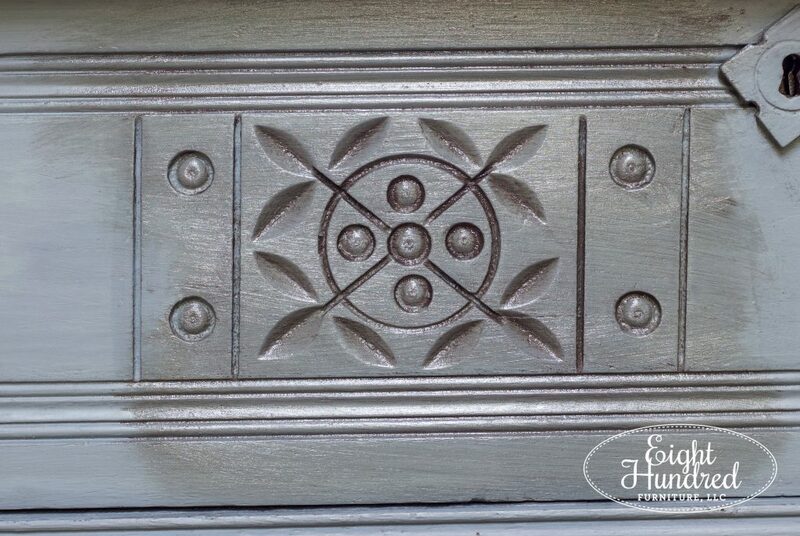 Can you see how adding the Antiquing Wax over the Hemp Oil added a lovely subtle shading in all of those gorgeous carvings? And let’s take a moment to appreciate those handles. 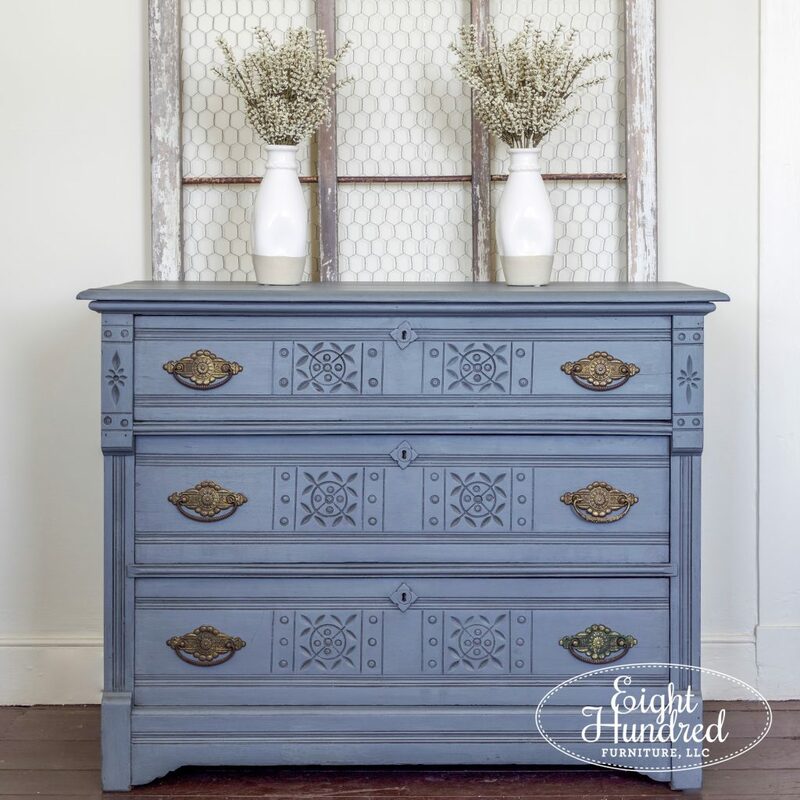 I rubbed them with some Antiquing Wax as well to tone down the bright brassy color. They play nicely up against the blue gray of Aviary. 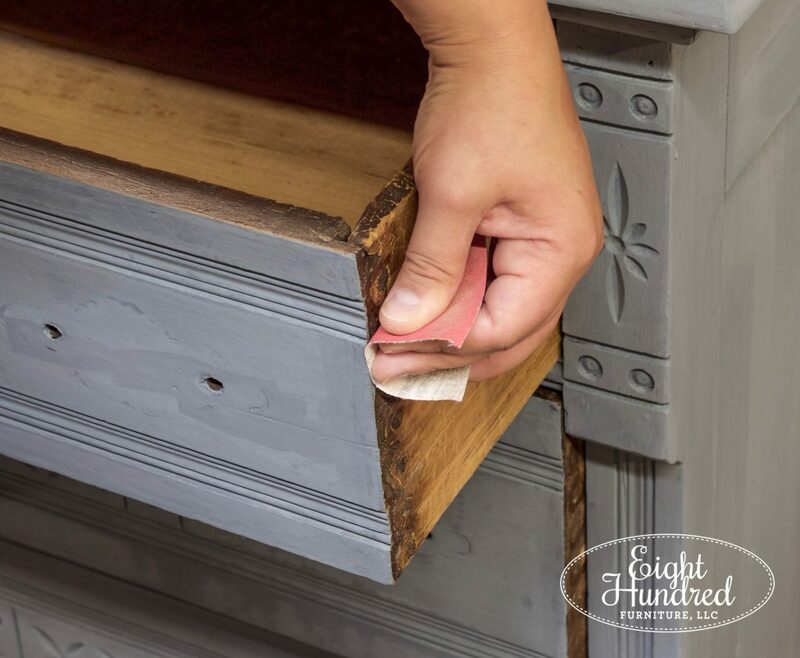 When I was cleaning up the drawers with sandpaper, I made sure to remove any paint that snuck around the corners near these gorgeous Knapp joints. Let’s pause for a second to have an antique lesson. 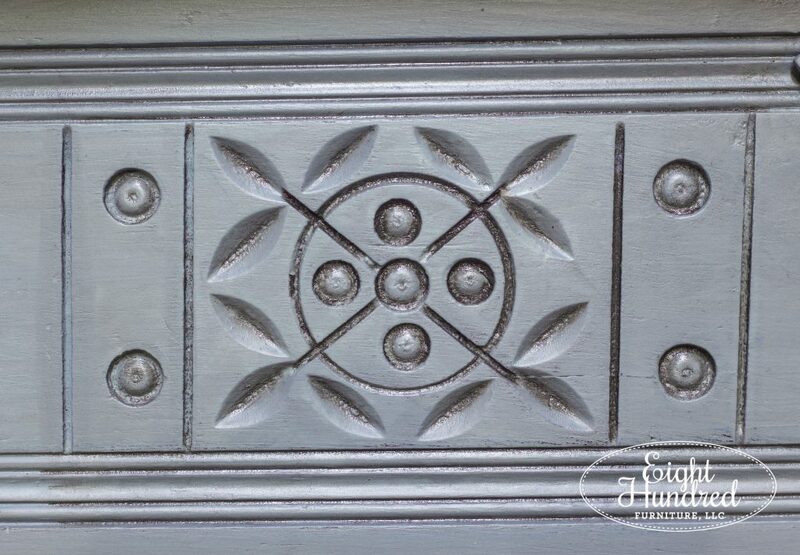 This type of joinery is called a Knapp joint and it’s named after its creator, Charles Knapp. 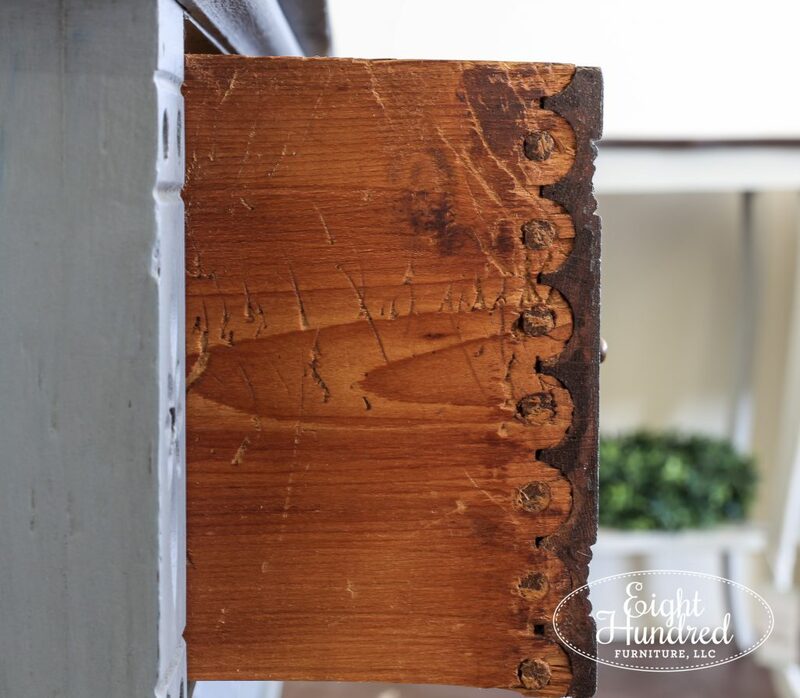 It was developed as an alternative to the dovetail joint and was only used from 1870 – 1900. 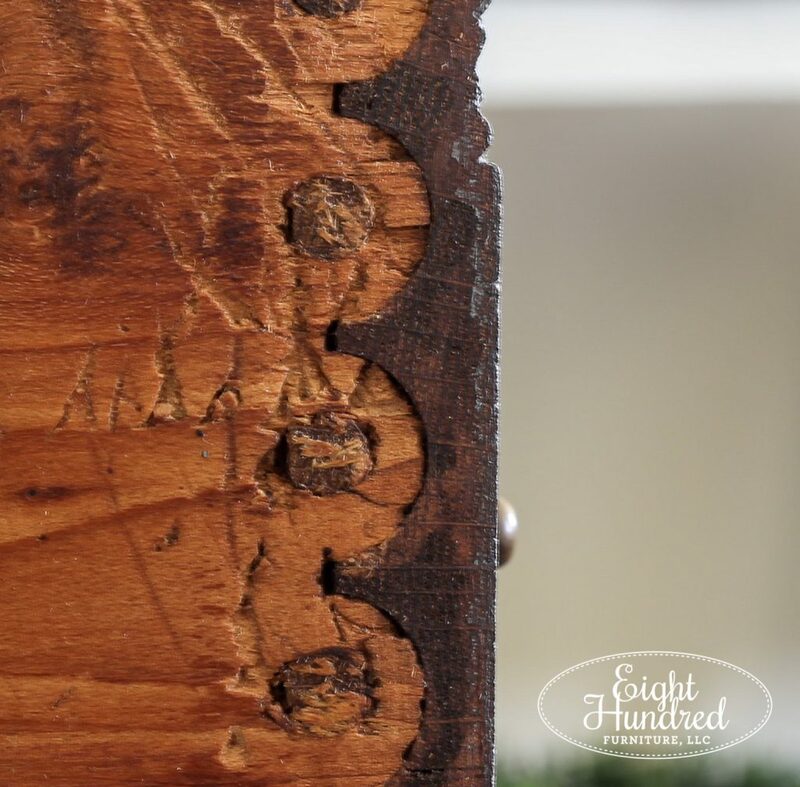 So if you find a piece of furniture with this kind of joinery, you know that it’s at least 118 years old. 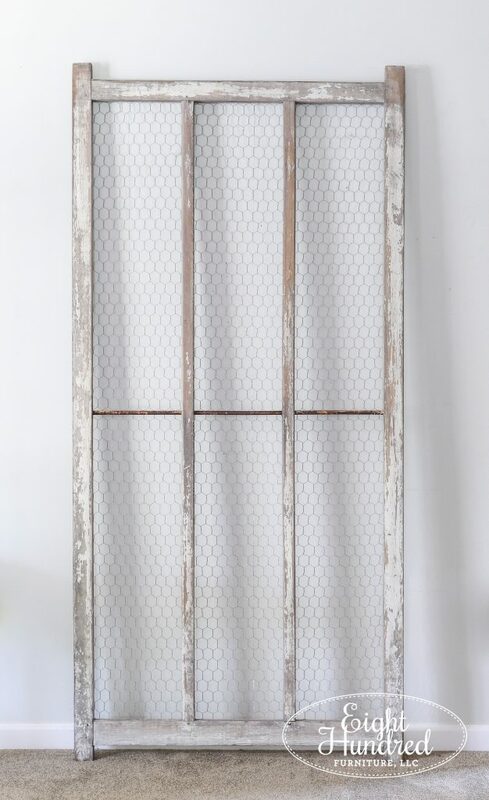 This joint is also referred to as a cove-and-pin joint because of the scalloped shape. You can also give them a call at 484-712-5087 if you want to reach out with questions or inquiries. So come on by and see my new digs! 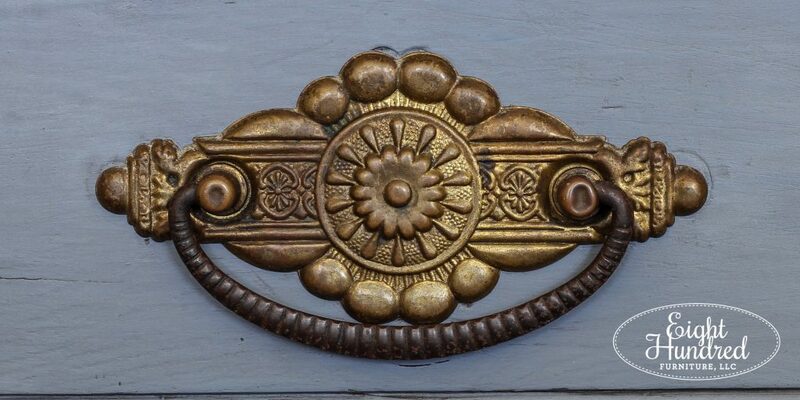 This pretty piece will be waiting for you.